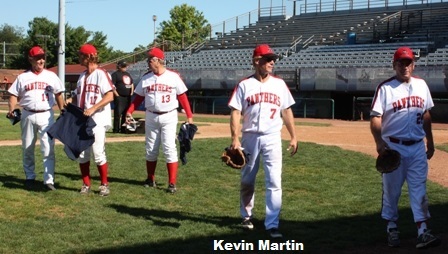 Shortstop Kevin Martin had an outstanding game for the first place Warren Panthers of the Ohio MSBL Timeless Division (60+) last Saturday, helping the Panthers maintain their first place lead. The 60-year old Martin went 4 for 5 with three doubles, three runs scored, drove in three runs and added a stolen base, raising his batting average to a solid .538 for the season. One of our best defensive players, Kevin also made several key plays in the field to keep our opponents off the scoreboard in the Panthers 12-2 victory. The Panthers, League Champions in 2015 and 2016, are now 6-1 for the season and currently hold a one game lead over last year’s League Champion A2Z Sports.